Base of the Kotab Minar, [Delhi]. 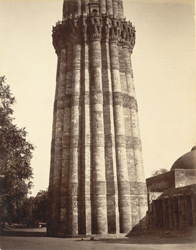 bl.uk > Online Gallery Home	> Online exhibitions	> Asia, Pacific and Africa Collections	> Base of the Kotab Minar, [Delhi]. Photograph of base of the Qutb Minar in Delhi from the 'Earl of Jersey Collection' was taken by an unknown photographer in the 1880s. One of the greatest monuments of Islamic architecture in India, the minaret forms part of a complex containing some of the earliest structures of Muslim rule in the country. Standing 72.5 ms tall, it was built as a celebratory victory tower accompanying the Quwwat-ul-Islam mosque and was probably inspired by the style of Afghan minarets. Inscriptions suggest that it was begun by Qutub-ud-din Aibak in 1198 and completed by his successor Iltutmish in 1215, although the two upper tiers were rebuilt at later dates. The chief material used is red sandstone. Four balconies separate its five storeys, and a beautiful effect is achieved in the lower three storeys which have broad carved bands of interwoven calligraphy and floral motifs. Within the minaret is a spiral stairway of 360 steps.